Typical street in Dubrovnik. Photographed while walking around the city walls. Recommended, great views all along the way. Tourists waiting for a ferry at Hvar town. Yep – the season has definitely started! Hvar is famous for its lavender fields. At this time lavender is still all green, luckily sage is in bloom. Sage blossoms can be found everywhere around the island and it smells so nice! Typical landscape of Hvar island (and many other Dalmatian islands). 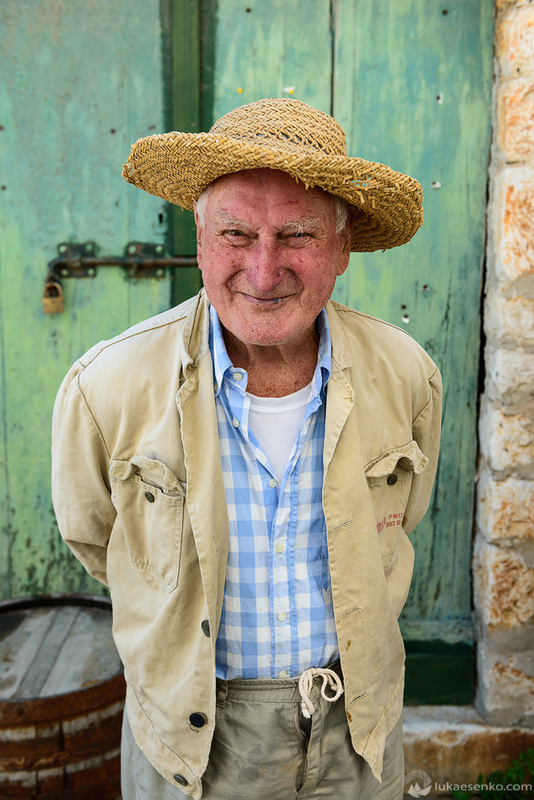 Antiša, 85 – still going strong, working in vineyards. I wish him many more years like this! No lakes or waterfalls from Plitvice this time. The forests are just wonderful, lush, quiet, away from all tourist crowds. Wild garlic fields are at full bloom. What a beautiful sight! We met Nada at Grožnjan – one of Istria’s beautiful hilltop towns. She was selling fritule (little donut like sweets). A warm smile and a couple of fritulas make your day nicer! Walking a dog at Motovun. Beautiful sky above Adriatic sea. At Rovinj. One of the coolest things in Istria is definitely Roman amphitheater at Pula. i had a great time touring Croatia with you. Love your photos! I hope our paths will cross again someday soon! Thank you Jeanne – hope to see you in Slovenia! Hi, Great and interesting photos Luka,. Well done, impressive. Thank you for sharing with us. Looking forward meeting up with you again, along the way with T & D on another Natural Exposures, photo adventure. You have an open invitation to explore New York City and the Metropolitan area, any time. Hi Joel, thank you! And see you either on a tour with NE or in NY!